Is a folk dance with 30 dancers. This ballet tells about the palace of queen Kediri kingdom. On the way from Bantarangin kingdomtoKediri, Singbarong as leader conquered tigers and peacocks. 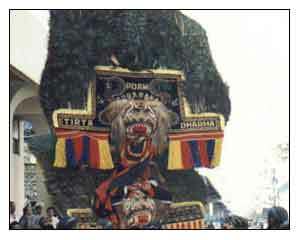 The prima dancer wearing mask from peacock leather with the tiger head and it weight is between 40 to 50 kg and is manly supported by mouthstrap clenched in the dancers teeth. The other dancer wearing the satan mask and this dance was from Ponorogo â€“ East Java.